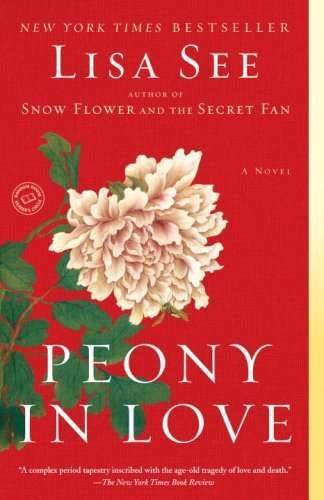 Peony in Love is a story set deep in 17th-century China, where tradition, folklore, and superstition rule the upper and lower classes alike. Peony is sixteen years old and obsessed with the famous opera The Peony Pavilion, which is based around two lovers who are destined to meet but only do so in a dream after two reincarnations. In the opera, the young maiden dies of lovesickness and goes to the afterworld to pay the price of her misdeeds, forever wandering and searching for her lover. After meeting in further dreams, the love between the maiden and her lover grows so strong that it brings the young girl back into the living world to have a second chance at life. Peony’s father makes arrangements for Peony to see the opera in person for the first time on her sixteenth birthday, just a few months before she is to be married to her betrothed husband, whom she has never seen nor met. While viewing the opera, Peony sneaks away for some fresh air and meets a poetic stranger on her family’s own pavilion. They spend the three nights of the opera together on the pavilion while the rest of the family is engaged with the performance. After brutally suffering from the idea of her fate to be married to someone not of her own choosing, forever parted from her beloved poet, Peony eventually withers away and dies of lovesickness. Her spirit flies to the afterworld, where she discovers that the necessary rites had not been performed upon her death, dooming her to wander forever, a hungry ghost. What follows is the tragic but hopeful tale of the power of love, even beyond the grave. This book was phenomenal. The fantastical elements made for an imaginative, artful tale that seemed to break my heart with each page. Lisa See has a gift for making her prose seem like poetry, and each line is delicious in itself to read. One of the ways I know I’ve found a great book is when I wish I were reading it instead of doing whatever else that I’m doing…this book sucked me in from page one and didn’t let me go until the last line, when I was finally able to breathe easily (and happily) from a satisfying ending. I was sad to come to the end, because it meant that there was no more left. And that is something that hasn’t happened for quite awhile. I would highly recommend this book for anyone not afraid of some pretty out-there ideas, and for anyone willing to believe that the power of love truly does not end with death.